NZ rugby may have a bob or two to rub together but that doesn’t mean they can afford to spare a certain Nichol. Since rugby entered the brave new world of pro’ sport roughly 20 years ago, it’s become one of the biggest businesses in New Zealand. Yes, it’s a simple game at heart – it’s catch and pass, mate. But behind the sport there are plenty of issues regarding player welfare; and behind those issues is Rob Nichol. At the helms of both the International Rugby Players’ Association (IRPA) and New Zealand RPA, Rob holds a unique vantage point on our game. After having many of my preconceptions challenged during a conversation which took longer than most scrums these days (about an hour longer! ), I must agree. Behind the scenes, there’s a lot to this seemingly simple ball game. We’ve covered many aspects but a number of recent off field incidences (everything from bathroom ‘antics’, to drink, drugs and domestic abuse) involving top level players make ‘misbehaviour’ impossible to avoid – sorry, Rob; I really did want to write more about other aspects! “You’re asking people to mature extremely quickly and perform. It’s not a matter of if they’ll make mistakes; it’s when. We’re dealing with men and women from about 17-36 years of age; they’re going to make mistakes and some of them are going to be made public,” he explains. I initially take his reaction to this line of questioning to be defensive. But, in hindsight I realise it’s not that at all. It’s frustration. It must be exhausting repeatedly giving the same assurances and explanations. While ordinary members of the public are much less likely to find their indiscretions splashed across the media, they can’t draw on the vast network of support which the Players’ Association and the wider rugby community can offer, he contends. “If you’re a professional rugby player from New Zealand and you make a mistake, you’re going to get very good support. The same levels of accountability may not be there in the public domain, but the levels of support aren’t either. Ultimately, the public eye amplifies such incidences. We can blame the players, we can blame ‘the media’ (or the public demand it feeds), but what we can’t do is ever guess at the pressures these guys face. Speaking of pressures, Rugby also mourned the loss of former Wallaby great, Dan Vickerman, following his suicide earlier this year. I didn’t know the guy, although I definitely respected his on-field abilities. Rob did know him. Whether Dan struggled to adapt to life beyond professional rugby or simply to life in general, we’ll never really know. However, Rob assures me that his associations, and the wider rugby fraternity, cut no corners when it comes to ensuring help is on hand. “The willingness of professional players to reach out for help needs to be talked about more. Those who have [asked for help] also need to talk more, to show that, if you do ask, it’s there,” he says. I guess there are no perfect people; we’re all prone to dropping the ball now and then and, sometimes, the consequences can be disastrous. I expected to come away from my discussion with Rob wiser, more insightful in regards to the pressures facing professional sportspeople. I don’t. But, in a way, this realisation is cathartic in itself. In an age where people are marketed as products (they wouldn’t get paid if they weren’t!) it’s easy to think we actually know these guys. To judge them we really have to know them and, well sports’ fans, we don’t. However, I am more assured that our guys have a sophisticated support network behind them. Rob’s parting shot is right on the money… there are no easy answers. Travel may well broaden the mind but it sure as hell can be exhausting! Rob Nichol may not have clocked up many air miles as a player but, during his work with the New Zealand and International Rugby Players’ associations, he knows well what it’s like to spend time away from his home ground. Originally from Stewart Island, Rob moved to Auckland, initially working as a police officer, before settling on a 10-acre lifestyle block in North Waikato. After laying the law aside, this qualified accountant came to turn his talents to helping run the NZRPA from the infancy of professional rugby. While maintaining players’ welfare may be a major part of the NZRPA’s remit, one aspect, travel, affects Rob as directly as the players he represents. 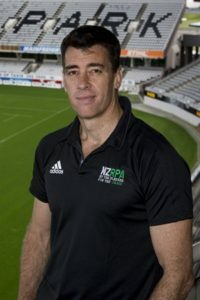 In addition to his role with the NZRPA, Rob is also chief executive of the International Rugby Players’ Association (IRPA) and chair of the NZ Athletes Federation – in effect, an association for players’ associations. However, he expects to curtail his time abroad soon. “As the kids [Josh, 14; Olivia, 13 and Sasha, 10] are getting a bit older, I want the reward of just enjoying seeing them with their friends and having fun. I really enjoy watching them [playing sport] and I want to be around more to see it,” he says. With Super Rugby facing further restructuring, and teams from Australia and South Africa expected to be dropped, Rob believes players could also enjoy more time at home in the years ahead. He says the NZRPA wants the Super Rugby season cut by a week or two but although travel schedules may impact on player welfare, that’s just one facet. Although players may need to travel, the job does permit time at home which a normal nine-to-five role often can’t. Rob says making the most of every moment at home is crucial.